The book itself has little to no plot. Instead, the narrator asks various animals what they see with the response usually being another animal, the respondent is then asked what they themselves see, and the process is repeated. It features a Brown Bear, Red Bird, Yellow Duck, Blue Horse, Green Frog, Purple Cat, White Dog, Black Sheep, a Goldfish, a Teacher or a Mother, and Students or Children. The 1984 British edition of the book substitutes a monkey for the teacher. Carle explained that variations in text between editions (mostly on the last page) were due to Martin, and that he made new illustrations to go with the changes. Missouri Governor John Ashcroft and First Lady Barbara Bush with a "Parents as Teachers" group at the Greater St. Louis Ferguson-Florissant School District in October 1991. Mrs. Bush (in a rocking chair) is reading Brown Bear, Brown Bear to the children. The book was one of the "Top 100 Picture Books" of all time in a 2012 poll by School Library Journal. As of 2013, it ranked 21st on a Goodreads list of "Best Children's Books," and the publisher claimed that there were "7 million copies in print in various formats and languages." ^ Polar Bear, Polar Bear, What Do You Hear? ^ Panda Bear, Panda Bear, What Do You See? ^ Baby Bear, Baby Bear, What Do You See? ^ Bird, Elizabeth (July 6, 2012). "Top 100 Picture Books Poll Results". School Library Journal "A Fuse #8 Production" blog. Retrieved December 12, 2015. ^ "Best Children's Books". Goodreads. 2008. Retrieved December 12, 2015. 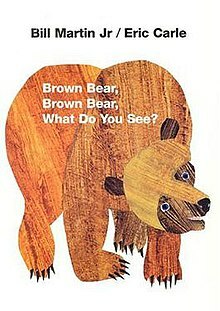 ^ "Brown Bear, Brown Bear, What Do You See? (Book & CD Set)". Macmillan Publishers. Retrieved May 21, 2013. ^ "Name confusion gets kid's author banned from Texas curriculum". Dallas Morning News. January 25, 2010. Retrieved March 17, 2010.